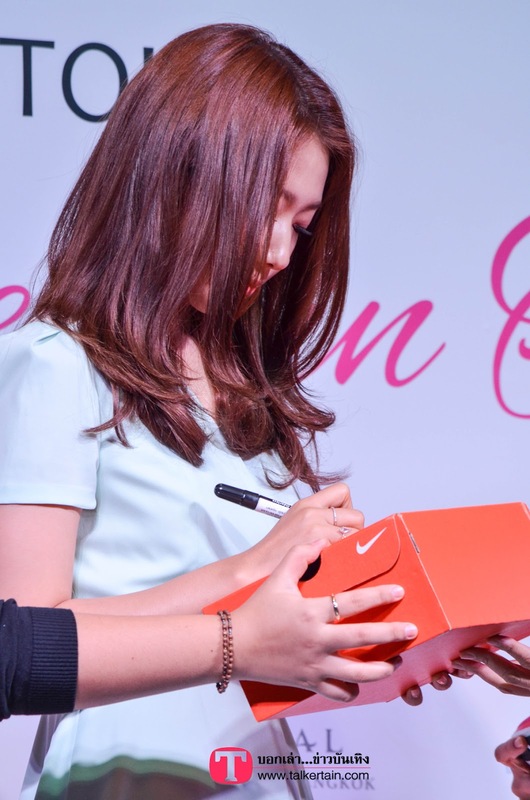 Park Shin Hye's first fan meeting in Thailand. 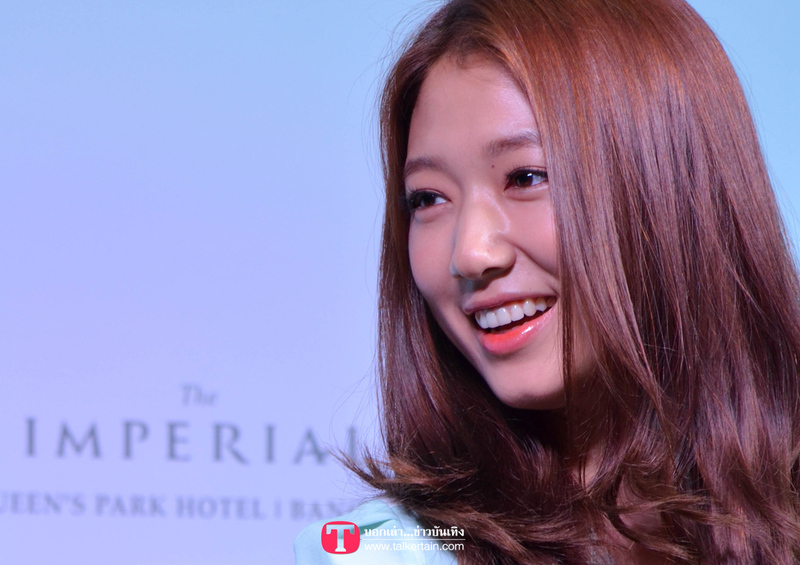 The Paeksang award winner is having her "Park Shin Hye 2013 Asia Tour, Kiss of Angel in Thailand. The tour commemorates her ten years in the entertainment industry. The fan meeting is Saturday, June 29th from 19:00-21:00 at the Grand Theatre Royal Siam Pa Lai, 6th Floor, Siam Paragon. 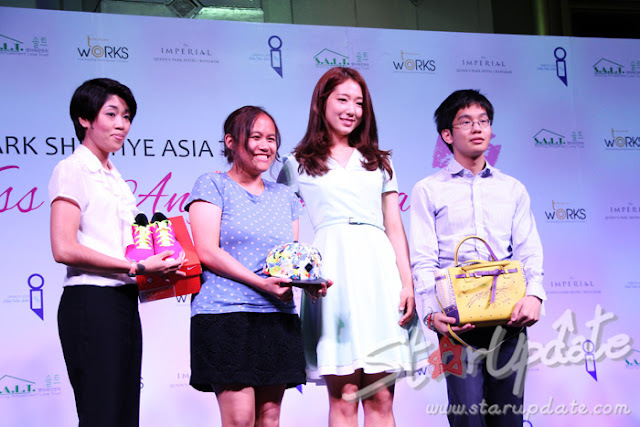 It is sponsored by I-RIM CO. LTD.
Three items of Shin Hye were held for auction. The three items are a hat, shoes, and a bag. The proceeds from the auction totaled 149,000 Baht ($5000). All proceeds were donated to the National Cancer Institute to support cancer patients. 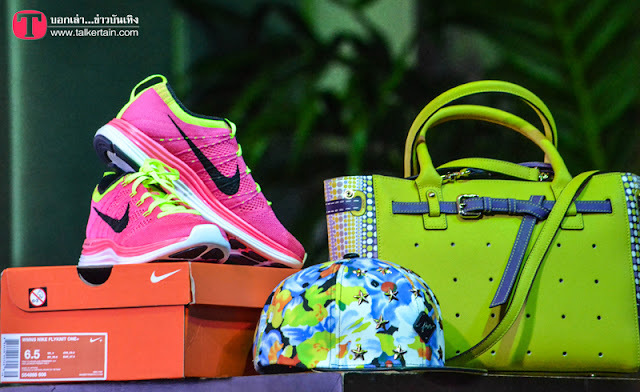 The winners of the items were awarded their item during the press conference on June 27th. 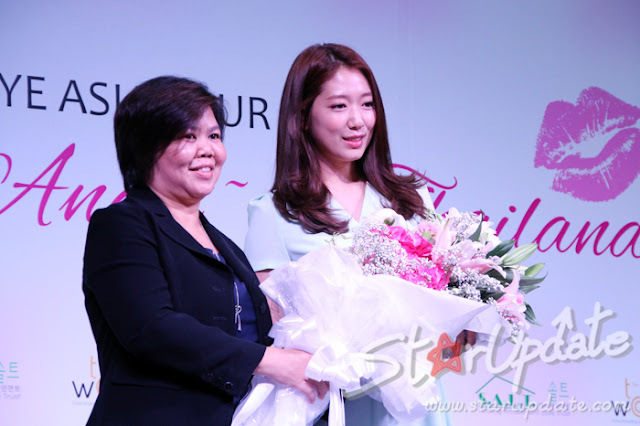 During the interview portion, Park Shin Hye said she was very excited to finally meet her Thai Starlight Angels and for everyone to have fun at the fan meeting. Asked what was her inspiration for the charity auction, she told about how she started out helping disadvantaged parents and then children. She thanked her fans for participating in the auction. 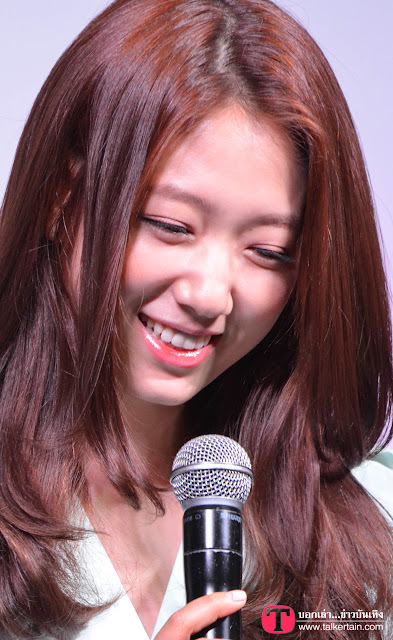 Park Shin Hye's name rhyme with vegetables in Thailand, hence the nickname, "baby vegetable." She jokes and said she will make everyone more healthy by watching her. They talked about "You're Beautiful." The host said it's always fun to watch it every time. And the shows garners many fans each time. 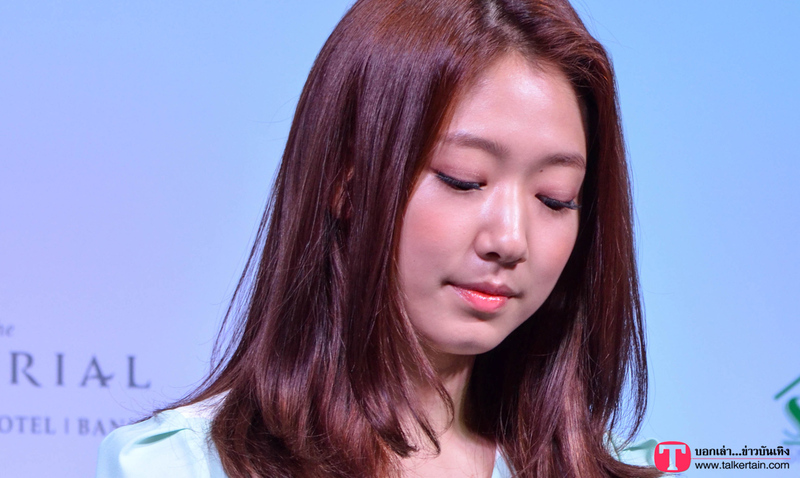 Shin Hye said she watches the drama when she's home doing nothing. The character she played was really fun. Asked about ANJELL, she said they were very hardworking. Jang Keun Suk was very responsible, Lee Hongki was very good and entertaining as always, and Jung Yong Hwa, although it was his debut, was very hardworking and not lazy at all. 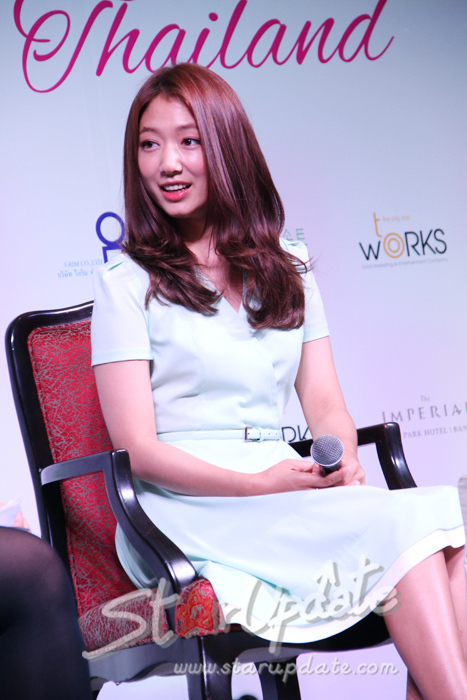 They talked about Shin Hye's new drama, Heirs. Shin Hye tells everyone to wait for it and that the story is brilliantly written. She wants to eat some Thai food, but not the ones at the hotel. They talk about Thai food and recommended some for Shin Hye to try. The press conference ended with Shin Hye inviting everyone to attend the fan meeting. She said even though she's not a singer or dancer, she's going to sing and dance and show everyone a good time. They're going to play and have fun together. Cute. I noticed her ring - is she engaged? If she is, I am very happy for her and it will not change my love for her. She is still my favourite Korean actress regardless of status. Same here. I don't mind at all too. Marry young, so that at 45 years old your kids are all grown-up and starting their jobs. I got married at 21, a week after my university graduation and to my one and only boyfriend. We've been married 18 years now and I'm only 39. Are you sure that she is really married? I have noticed the ring as well, but is it really it?